This weekend I had the pleasure of watching Into the Wild on DVD. Since watching the movie I couldn't help but scour the internet for everything tidbit of information I could. This is one of those tales that truly gripped me. 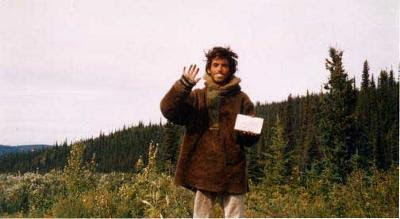 Christopher McCandless was a very interesting person in my mind, even more so after I took time to do a little more research about him after watching the movie. One picture I found was a self-portrait, it wasn't in the movie but the picture defines him in my mind. I have so many thoughts swirling around in my head, but I simply cannot break away from just how much strength it would have taken to take this picture, knowing now the story behind it and what he must have been going through. The smile on his face tells so much about his character. 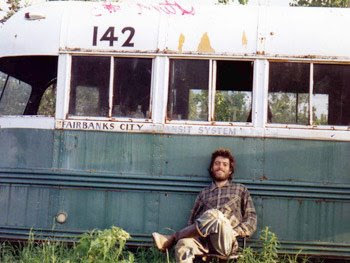 The picture at the end of the movie shows him in a much better light, it is also a self-portrait and shows him sitting outside the "Magic Bus" he found on his journey. It should be obvious by this point that this movie is based on a true story. It covers the travels of Christopher McCandless, aka Alexander Supertramp. The story takes place from 1990 to 1992 and director Sean Penn does a wonderful job of telling it, however some Hollywoodization of true events is somewhat expected. Also, Christopher didn't keep a very in-depth journal during his travels, so it's hard to say how real events played out during certain periods of time. Some people have called him crazy, but while he may have been a bit ill-prepared for his adventures, I can respect the type of person he appears to be. If you haven't seen this movie, please do. I will be picking up the book by the same name in the near future, I suspect it will be a very good read. Okay, okay, here is one of my pictures I took while I lived in Alaska. All hail The Last Frontier! I've been wanting to watch this movie for a while now. I may go rent it tonight! My family and I talked about going to the theater to see this movie, but we did not. You have reminded me why we wanted to see it in the first place. Now that it is out on DVD, we must see it. I have watched movies in the past and been disappointed after reading "the book" because I have discovered "the book" to be so much better..so much more inclusive. I suspect McCandless' book will be even better. I hope to read your review. Heck, I may even pick up a copy myself and read it over the summer. Thanks for the post and the pictures. Thanks for the comments! I actually ended up buying the movie today. Renting it just wasn't enough. This is definitely a flick I proudly add to my collection! I heard that this is good, so I have three on line scheduled to be borrowed or bought..this is the third. Thanks for sharing. I saw the movie when it hit the theaters in Vancouver (BC). I haven't read the book but my husband has. The idea of losing one's self to find life's true meaning, per se, is good. However, there were little details that could have been improved to make such message more gripping. Thanks for the tip Brady. Will definitely look out for this one. The book is amazing. Now I have to catch the DVD. Didn't know it was out. The book and the movie are both amazing. I actually recently came home from a trip to Alaska, and me and two friends hiked out to the bus. It was an awe-striking experience. Just to imagine what had happened at that location and all that he went through, and we were there. 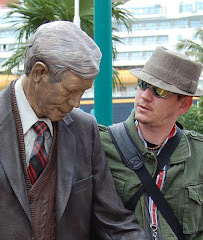 There is a plaque from his family and a suitcase with journals for you to write in about your experiences. The trail is actually very easy. The hardest part is getting across that river. It is doable at a certain spot and a group right behind us put up a zip line to hold onto when crossing the hardest part. If anyone reading this gets a chance to go to Alaska, go to the Stampede Trail and hike to this bus, you will not regret it. It is about 150-200 miles north of Anchorage directly off of the highway to Fairbanks.